The old personal flotation device (PFD) that I had with me for about 6,000 miles of small-boat cruising between 1980 to 1987 was given to me by my next-door neighbor. He said it was the type used by longshoremen working the docks. Like all PFDs of that time, it had no pockets. 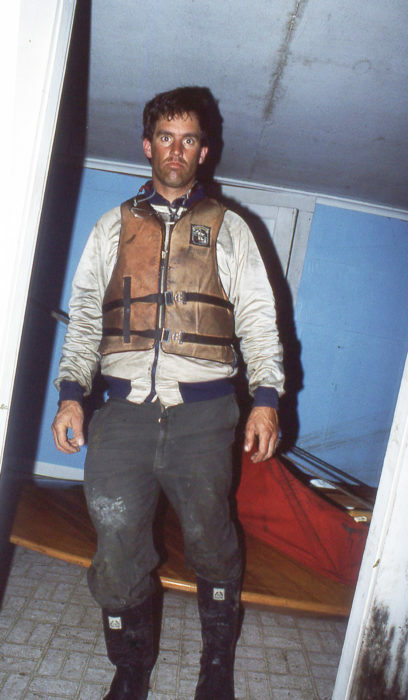 I got a lot of use out of that PFD on my cruises, but all it ever did was keep me a bit warmer and help explain my grubby appearance when I walked into town: “I’m not destitute; I’m boating.” Here, I’m two months into a wintertime river voyage. Behind me is my sneak box, hauled into an abandoned house in Louisiana that had half fallen into the Pearl River and lost its living room’s riverside wall. My recollection is that the Coast Guard or Underwriters’ Laboratories would not approve pockets because they could be filled with lead shot and sink a PFD. I couldn’t carry anything on my old PFD, and even if I had pockets in a jacket, they’d be covered by the PFD. Sewing pockets on a PFD would void its status as an approved flotation device, so I later sewed up a vest with pockets that I could wear over my PFD. Shortly thereafter, in the ’90s I think, PFDs with pockets were given approval and came on the market. I met a Coast Guard rescue swimmer, a guy whose job is to jump out of helicopter to rescue boaters in distress. He said something that stuck with me: “If the gear you need is not on you, you don’t have it.” The bulging pockets on his PFD and dry suit proved the point. I was doing a lot of sea kayaking then, and a capsize was something I had to be prepared for. In a worst-case scenario I’d have to contend with losing my kayak, and my survival and rescue would depend on what I had on me. When I’m wearing my PFD, it appears I have only two items with it; a VHF radio and a rescue knife. The PFD I’ve been using for the past several years is the Guide model from Kōkatat. It does much more than keep me afloat. It has a top-loading electronics pocket on the right, a side-loading, stretchy mesh pocket on the left, and small top-loading pocket behind the zipper; all of the pockets have rings sewn-in to anchor tethers. The two lash tabs on the front of the PFD and one on the back provide places to mount gear on the outside of the PFD. There are retroreflective patches on the front and back for night search visibility. My current PFD, shown above with everything tucked away, has what I need to help someone in need, including myself. 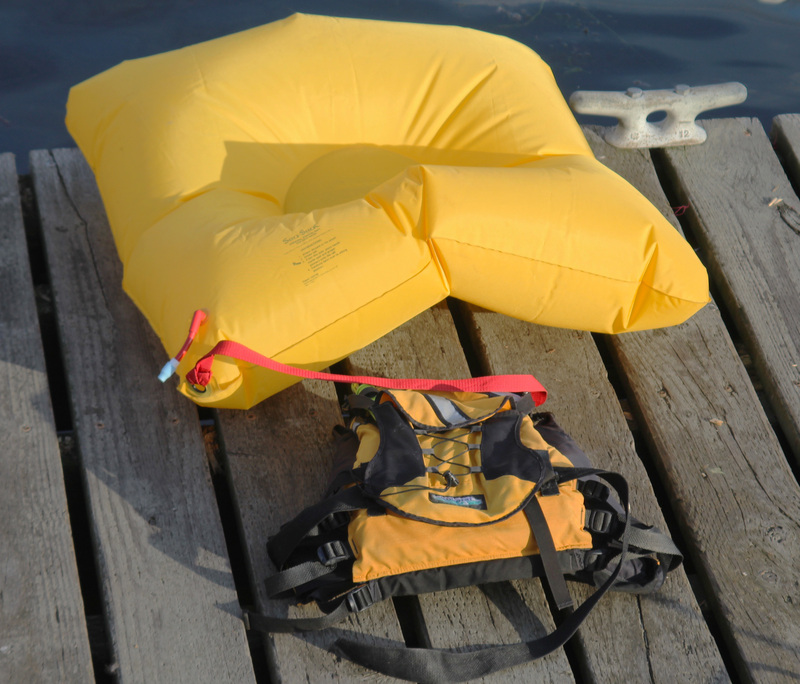 The PFD has a belt with the quick-release buckle; it’s part of a towing system for use while kayaking. I don’t need to tow with my PFD when I’m aboard my other boats, so I’ve taken the O-ring, the towline, and the towline’s pouch off. 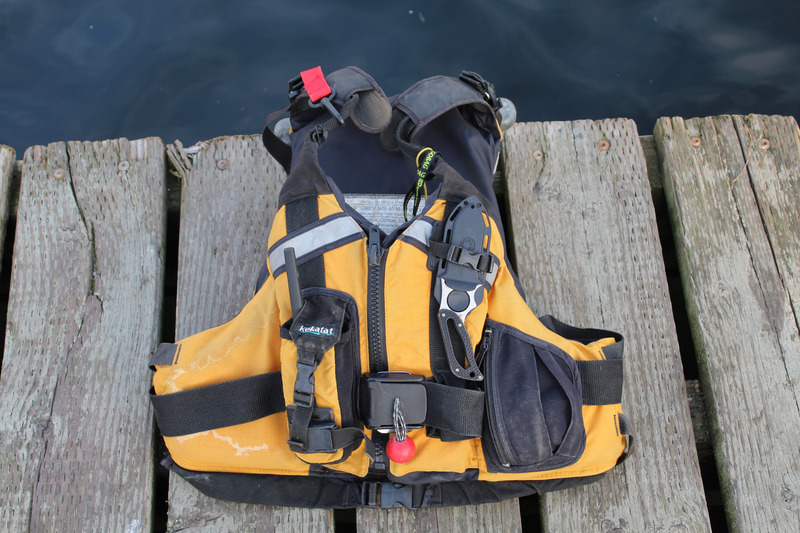 The towing belt, by the way, makes the PFD a rescue vest, classified as a Type-V, special-use life jacket, though all the other features are available on the more common Type III recreational vests. On the back I have a PFD light and pouch for my Sea Seat. I added an accessory pocket to the back of my PFD, anchored to the shoulder straps and belt loops. Its Velcro-secured top flap has its own retroreflective patch. 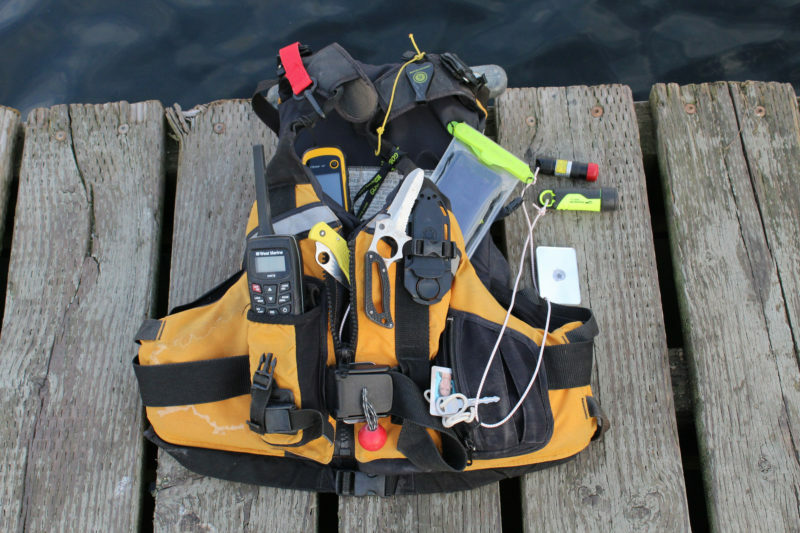 Here’s what I carry aboard my PFD: The electronics pocket holds a handheld 6/2.5/1-watt VHF radio. It’s waterproof (IPX7) and floats. In the mesh pocket are a signal mirror, a flashlight, and a rescue laser light. I used to carry a set of three aerial flares, but switched to the laser because the pyrotechnics burn for just a few seconds and have to be replaced every three years. I also keep a spare car key and an expired driver’s license in the mesh pocket. The license is laminated plastic and waterproof, and has my name, picture, and address on it. On the back of the license I’ve written my phone number, in case I misplace my PFD and someone finds it, and phone numbers for emergency contacts. The lash tab above the left pocket has a rescue knife in its sheath. The knife blade is made of rust-proof H-1 steel. It has a blunt combination serrated/plain cutting edge, and a line and bungee cutter on the spine. My whistle is tethered to the shoulder strap above the knife. The small pocket concealed behind the front zipper carries a rust-proof folding knife with a plain blade. It has a large hole in the blade so I can open the knife with one hand. The PFD has buckles and the belt holding it in place, so it’s safe to open the zipper to get to the knife. 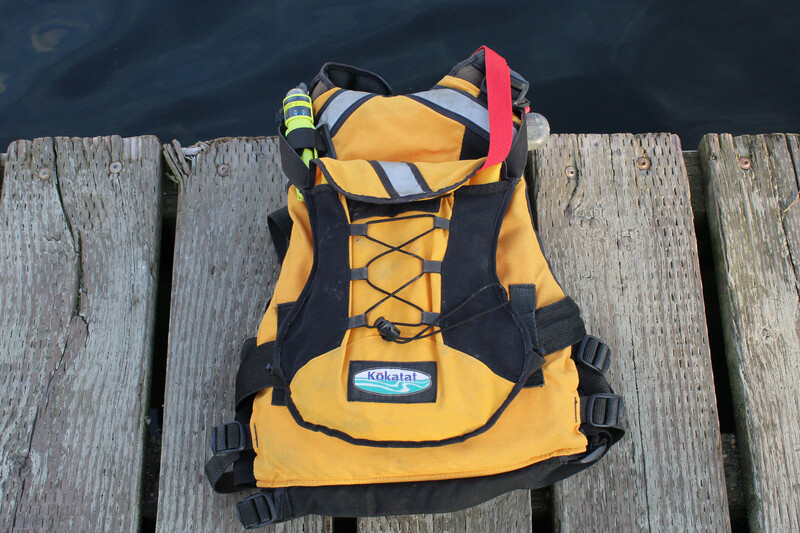 I’ve done a lot of sea-kayak self-rescue practice while wearing my PFD, and when I scramble over the aft deck I haven’t had any trouble with the gear on the vest front snagging deck lines. The Sea Seat, pulled from the PFD pouch by its tether, takes about 60 breaths to inflate. It’s then big enough to support me, seated upright and mostly out of the water. The pouch attached to the back holds a Sea-Seat, a 38″ x 40″ inflatable “personal survival raft for cold water.” (The Sea Seat, dating back at least to 1986, has been out of production for decades and as far as I can tell, its Canadian patent—1550108—has expired, just in case someone is thinking of reproducing it.) The raft is orally inflated and has a depression in the middle to provide a stable place to sit. I clip the Sea Seat’s tether to my right shoulder strap, and giving that a hard tug will pull the folded seat past the pouch’s Velcro closure. I’ve practiced with the Sea Seat in breaking waves, and I’ve been able to inflate it easily and get aboard. Sitting in the depression, I’m fairly stable, even in whitecaps, and I’m mostly out of the water and my hands are free to tend to tend to distress calls and signals. The lash tab on the left side of the back has a small PFD light that I can turn on my reaching back and twisting the top. I carry my smart phone in a waterproof case that is tethered to the left shoulder strap; the phone gets tucked down inside the front of the PFD where it’s out of the way and well protected. My waterproof (IPX7) GPS is tethered to the right shoulder strap and also tucked inside the PFD. The XL Guide PFD has almost 17 lbs of buoyancy, and mine keeps me afloat even with all the gear I have attached to it. It not only tips the odds more in my favor but also puts me in a position to help others more effectively. I never regret wearing it. Unfortunately the rescue laser can’t be swapped out for the flares to meet CG night standards so I carry both. Also a handheld compass. And adventure racing got me to buy one of the personal EPIRBs required. Depending on cell phone coverage, one of those expensive beacons like a SPOT or Garmin can be swapped in. Document pouch can also carry 20 bucks. The after pouch can also be used for a mini survival kit, and/or take a water pouch. You’re quite right about the laser signals—they don’t meet USCG requirements. Greatland Laser markets their devices as accessories to USCG-approved signaling devices. While I stopped keeping a set of Orion’s pocket-sized Skyblazer aerial flares in my PFD, I carry a flare pistol with four 12-gauge aerial signal shells for it in the kit I take aboard my boats. 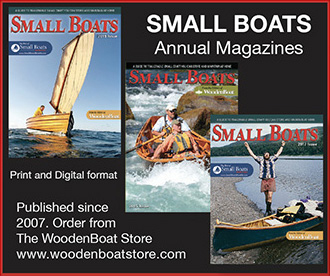 The pistol is too bulky to carry in my PFD, but it’s close at hand in my boats. For some of my kayak cruises I’ve carried a SPOT device. It can get a signal out in places where VHF contact isn’t effective. Out by myself in First Mate, and particularly at night, I wear a PFD with a collar…. no pockets. Instead, I have a small Plano soft tackle bag (about the size of a house brick) clipped to my chest via ties on my shoulder straps. It’s not particularly cumbersome to wear and around here it’s a long way between islands and other boats should you find yourself alone in the water. It carries a 5W VHF, headlamp with strobe, yellow buff with reflective stripe, (for visibility and head protection), an orange bivi sack (to climb into… every few years someone in the water here gets eaten), PLB and mirror, whistle, compression bandage and electrical tape. Everything is tethered and waterproof to IPx7 or 8, but bagged anyway. A knife lives on the PFD. It’s easy to unclip to carry ashore. Looks like a great setup Chris. We had some nice survival-vest (SV) and life-preserver (LPU) gear in the Marine Corps, different survival vests for dry or wet environments. Lots of pockets. I also flew Search and Rescue,in the UH-1N helicopter, with the Marines out in Yuma, Arizona, one of the busiest SAR units in the military. The GPS, PLBs, and EPIRB are great for getting rescuers to the general area, and the signaling devices you have are phenomenal for terminal guidance. A small light source can be seen at night for miles with NVGs (night-vision goggles), and the mirror works great on a sunny day. I especially like the amount of reflective tape on your PFD. Our helmets had white reflective tape underneath camo covers, folks who wear whitewater helmets might consider adding some reflective tape. Also on the helmet was a Velcro patch, our strobe also had Velcro so you could stick it to the helmet. Those without a helmet might consider a velcro patch on a shoulder. Here’s a link to some great photos of Navy SVs and LPUs. Hunt around a little and you can find a CG survival aka boat crew vest. Amply fitted with pockets. Useful if your PFD is an inflatable. It will work even with a waist band inflatable which is now the fashionable way to go with a SUP. Ben Fuller, would you wear the inflatable under the Coast Guard vest, and, if so, how would you fit it to not come off you if the the other were inflated? My PFD pockets carry pretty much what yours do, except the Sea Seat and I still have the 3 pyrotechnic flares. I also have my InReach SE instead of a GPS. The other thing I carry on my person at all times is a small waist-pack dry bag that has, within it in further waterproof bags, my cell phone, my wallet, my passport if in international waters, car keys if I’ve departed somewhere that I have had to leave the car parked, a spare disposable lighter for starting a fire should I get washed ashore and a micro-Leatherman multi-tool.